CULVER: LAKE MAXINKUCKEE is the second largest, spring fed lake in Indiana! This 1,864 acre all sports lake is nicely located just 2 hours from Chicago and Indianapolis! 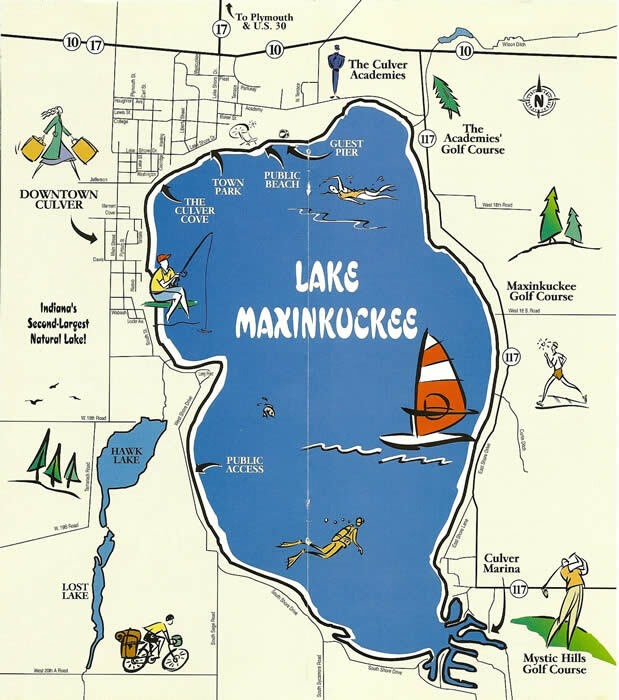 Lake Maxinkuckee has a maximum depth of 88 feet and an average depth of 24 feet. Lake Maxinkuckee is famous for some of the best walleye fishing in the midwest, as recognized by Field & Stream Magazine. Local fishermen often go ice fishing here, the most frequent catch is bluegill but yellow perch, crappie, and bass are also common. The first inhabitants of this lake were mound builders, probably of the Potawatomi or Miami Tribes. They are thought to have called it "Clear Blue Water" in their native tongue. Several mounds were built on the banks of the lake which were probably used as points of reference for the natives. The first white settlers came in 1836. Henry Harrison Culver, for whom the town is now named, founded the Culver Military Academy in 1894! KNOX: BASS LAKE is the third largest natural lake in Indiana and actually stands on top of a hill! A unique lake in Indiana that covers more than 1,400 acres! Natural springs and a few flowing wells maintain the lakes water level which is guaranteed by an outlet dam. The maximum depth of Bass Lake is 32 feet. The long and sandy beaches and great location make this lake a favorite getaway for many! Although it is primarily a summer resort now, many years ago the Knickerbocker Ice Company of Chicago used to cut thousands of tons of ice here and stored it in huge lakeside warehouses, then shipped it by train to Chicago! PLYMOUTH/CULVER: LAKE LATONKA is a private lake just minutes from Culver or Plymouth. You must own property on this lake in order to enjoy the 120 acres of water! Jet skis and waverunners have been banned on this lake but you can still enjoy water skiing/tubing and the private beach too! There is also a private park for you to enjoy! KEWANNA: BRUCE LAKE is well known for its perch, crappie, large mouth bass, muskie and blue gill fishing, quiet pontoon rides and amazing sunsets! Nicely located just miles from Rochester, Winamac or Culver right off of S.R. 14. On the west side of the lake there is a marked sandbar that is popular for swimming. This lake is spring fed and varies in depth from 1 foot at the shore to 25-38 foot channel in the center of the lake with a 10mph speed limit. Many have chosen this lake to get away from city life, as it is only about 2 hours from Indianapolis and Chicago! 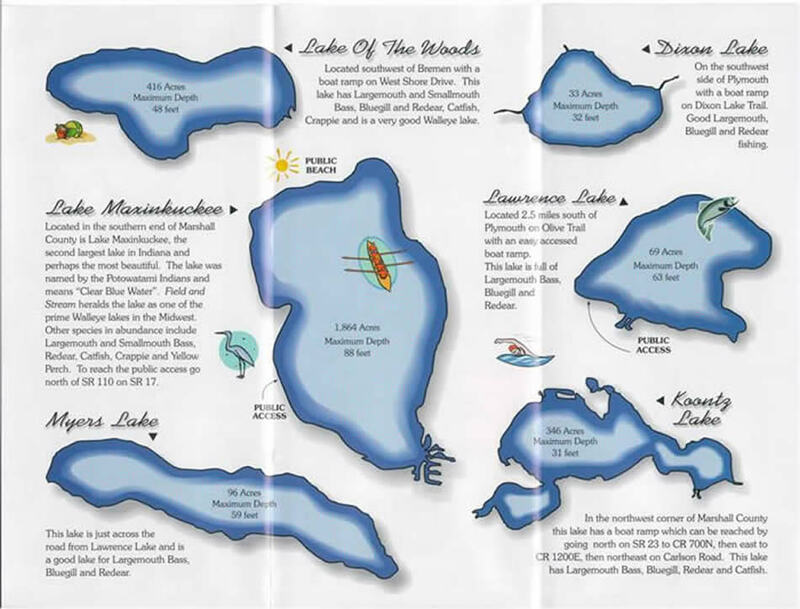 ROCHESTER: LAKE MANITOU is a man-made lake in Rochester with a maximum depth of 65 feet. In 1827 on what now is the area south of the dam the U.S. government constructed a grist mill to grind corn for the Potawatomi Indians under the terms of a 1826 treaty. To obtain water power a dam was built near its present location. This flooded the area around five lakes and formed Lake Manitou of 775 acres. Lake Manitou, also known as Manatau or Manitau derives its name from the Potawatomi word used both for "good spirit" and "evil spirit." The Indians, who fished and hunted in this area for 150 years believed the lake's waters held a monster fish or serpent of supernatural powers. Early settlers knew the lake as Devil's Lake. Tippecanoe River is a gentle, 225 mile long river in northern Indiana that flows from Big Lake in Noble County to the Wabash River in Tippecanoe County. Considered the river of lakes, it is fed by 88 lakes and has a drainage area of 1.25 million acres covering 14 counties. This important river supports a diverse aray of species, including those found in the Tippecanoe State Park in Pulaski County. Also, home of the Battle of Tippecanoe in which Governor William Henry Harrison defeated the Indian confederacy of Tecumseh, near what is now Lafayette. While some believe the Tippecanoe name is Indian for "Buffalo Fish" (aka Pike) others believe it is because there are so many shallow areas and rocks/fallen trees that will, tip a canoe! *Note all water depths are approximate, all lakes are subject to rain/snow fall changes.